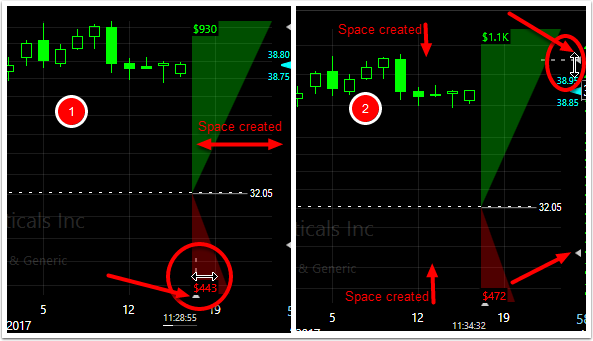 The trading P&L Zones™ (profit/loss) are graphical displays that show the potential areas for and estimated amounts of profit/loss from the entry price of an equity or options position. 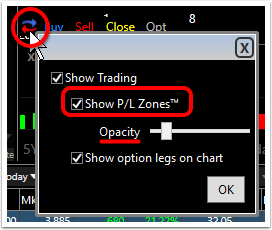 For any trade in either simulated or live trading, the zones are automatically calculated and displayed. Buy order: an order for a long position will show the break even point (the actual price level of the order) as a dashed line with potential profit (green) shown above and potential loss (red) shown below that level. Sell order: an order for a short position will show the break even point (the actual price level of the order) as a dashed line with potential profit (green) shown below and potential loss (red) shown above that level. Long Position: a long position will show the break even point (the actual entry price of the position) as a dashed line with potential profit (green) shown above and potential loss (red) shown below that level. 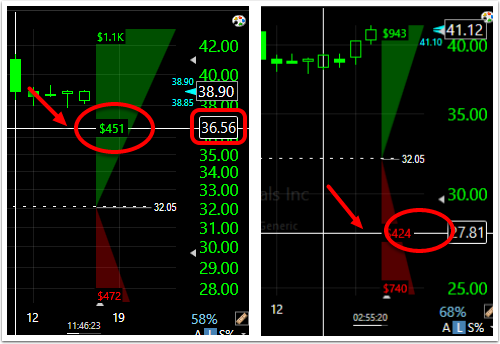 Short Position: a short position will show the break even point (the actual entry price of the position) as a dashed line with potential profit (green) shown below and potential loss (red) shown above that level. Note: the P&L Zones™ will show increasing value both directions by the color zones getting larger. This represents the unlimited potential for profit or loss with equity positions. Place the cursor on the chart at any point. Click to activate pointer mode (crosshairs appear). Note the value in the P&L Zone. This represents the amount of potential profit (or loss) if the position were closed at that price level (shown in white box on the scale).